Relax on the edge of Lake McLaren, watching the swans and ducks go about their evening’s preparations. Let our guides lead you onto calm Lake McLaren at dusk. 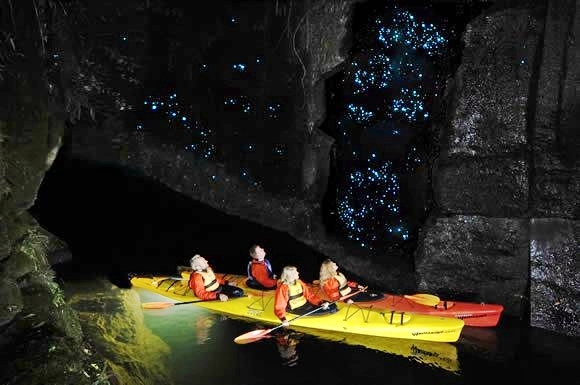 Gently paddle into the night and discover the magic of the enchanting glowworm canyon. If any of the above words described the activity you and your group are looking for the Glow Worm Tour is for you. The evening will begin relaxing on the edge of Lake McLaren enjoying delicate New Zealand cheeses and refreshments or maybe a gourmet dinner…. Our guides will prepare to lead you along the picturesque Lake McLaren into the mysterious glow worm canyon. 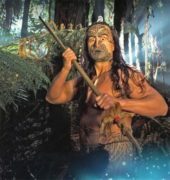 A truly magical, unique and inspiring experience not to be missed. Fully guided and transported from Waimarino. Double sea kayaks, paddles, spray decks, buoyancy aids, fleeces and paddle jackets all included. Approx. 1½-2 hour paddle (3½ hour tour). Enjoy our Cheese Board & Fruit Platter with NZ wines & Juice at sunset during the warmer months, with salami & olives and mulled wine replacing the fruit platter and NZ wines during winter. Enjoy a full sit down Gourmet Dinner with NZ wines & Juice at sunset. (Lake McLaren Glow-worm Tour full Gourmet Dinner). All ages welcome. The youngest person to enjoy the tour to date was an eight-year old who fell asleep in the kayak with his father. This tour can operate in fair weather conditions. Please contact Waimarino if in doubt. Please wear comfortable light warm clothing , but preferably no jeans. The cooler or wetter the weather the more equipment Waimarino provides for the client. Transport is included in the tour prices from Waimarino to the activity launch site and return. Pick up/drop off vehicle transfers are available from & to your accommodation to Waimarino and/or the activity launch site. Vehicle transfers from & to your accommodation in Tauranga and Mount Maunganui are $25 per vehicle per collection point. Papamoa or Katikati areas are $50 per vehicle per collection point.